Today’s quads were full of exciting matches. 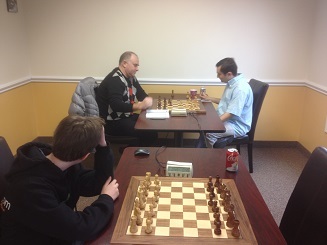 FM Leif Pressman and NM Nicolas Checa battled for first place in the final round. Despite being up two pawns, Pressman was unable to convert against the tenacious defense of Checa and the game was drawn creating a tie for first. The next section, a six player swiss, saw a very rare event when four players tied for first place. The winners were Dennis Li, Hubert Herring, Viktor Urvantsev and Kenneth Young. The final quad was won convincingly by the fourth seed Gabriel Borges with 2.5/3.